Be the first to share your favorite memory, photo or story of Joyce . This memorial page is dedicated for family, friends and future generations to celebrate the life of their loved one. Joyce Charlene Hardrick (nee. 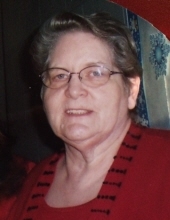 Stabley), a resident of Pontiac, MI died on February 6, 2019. She was 78 years old. Joyce was preceded in death by her first husband, Grant Lee Thompson; daughter, Michelle Lynn Isaacs, parents, Oscar Merlin Stabley and Queenie Josephine Stabley; grandchildren, Tammy Lynn Prough and Ashley Jo Odden and her father and mother in law, Acy Hardrick Jr. and Aldonia D. Hardrick. She is survived by her husband Acy Hardrick III; children, Joseph Nelles Isaacs, Michael Grant Thompson, Carrie Icsole Thompson, Jeffery David Thompson, Deborah Denice Thompson, Vickie Renee Odden, Timothy Odden, Robert Murlin Thompson, Pamela Sue Thompson and Susan Marie Bentley; grandchildren, Jamie Lee LaPlante, Christopher Edward LaPlante, Mary Ruth Greene, Darrel Greene, Jason Michael Thompson, Ryan Grant Thompson, Eric Joseph Thompson, Teia Lee Irwin, Chad Jeffry Irwin, Teresa Dawn Thompson, Bradley David Thompson, Brett Robert Thompson, Jesse Lee Odden, Cody Rodger Odden, Candice Jo Herrick, Lucuss James Odden, Rex Matthew Odden, Justin Michael Bentley, Amber Lynn Bentley, Branden Grant Lee Bentley, Logan Jack Bentley, Dillian Mark Bentley, Taylor Ann Thompson and Melody Jennifer Thompson; brothers and sisters, Gail Jean (Everett) Stockwell, Judy Ann (Jerome) Bradford, John David (Celia Paulette) Stabley, Frank Carol Stabley and Kristine Kay (William Robert III) Holmes; brother in law, Jose Fernandez Hardrick and sister in law, Renetta Hardrick, as well as 36 beautiful great-grandchildren and many close nieces, nephews extended family members and dear friends. A Funeral Service will be held at Lynch & Sons Funeral Home, 404 E. Liberty St., Milford, on Saturday, February 9, 2019 at 4:00PM with gathering to begin at 1:00PM. Pastor Steve Swayze officiating. For further information please phone Lynch & Sons, 248-684-6645. "Email Address" would like to share the life celebration of Joyce Charlene Hardrick. Click on the "link" to go to share a favorite memory or leave a condolence message for the family.